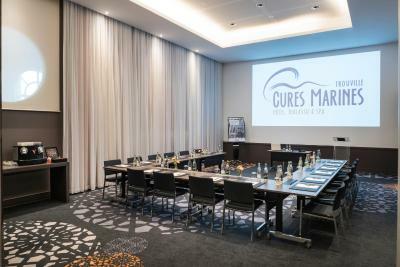 Lock in a great price for Cures Marines Trouville Hôtel Thalasso & Spa - MGallery by Sofitel – rated 8.9 by recent guests! The hotel is located close to everything - the shops, the fish market, the restaurants. The room service was quick and the food good. Very friendly staff. Best bed, pillow and sheets I have slept on in years. Amazing service and great room. The all staff was very efficient to answer to any of our request. 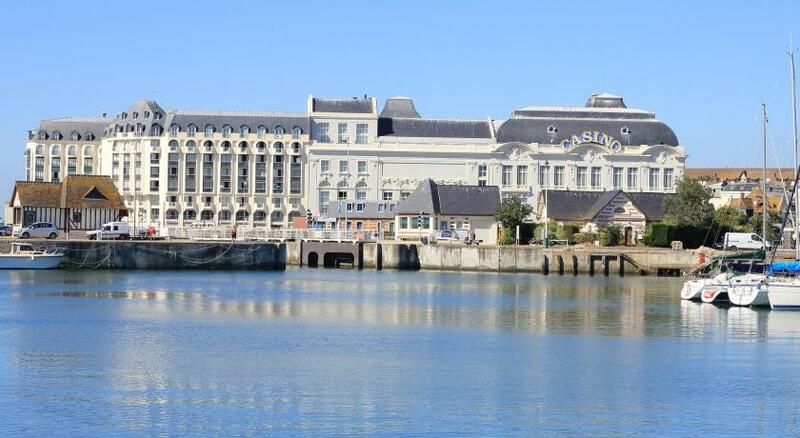 This is a brave modernisation/restoration of the beach side of the Trouville Casino. 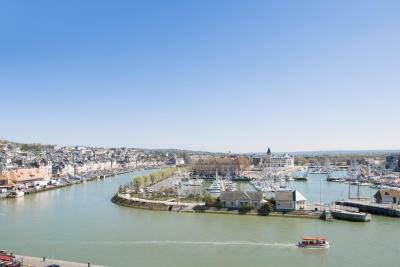 Trouville is slightly quieter, old money, twin to Deauville, sadly just a bit far to walk between the two. The bed was good. Comfortable modern hotel with efficient staff. Breakfast was excellent. Fabulous hotel, great staff from Sam the concierge to the front desk they couldn’t do enough for you! Rooms are great! Very nice location at the beach front. Modern but classy styling. Attentive receptionists. A very nice spa and pool area with observer. Good soundproofing and airco. The service, the building, the quality are all superb at this hotel. Honestly one of the best hotel stays we have every had. A true 5 star hotel, great location, and very nice staff. A little bit over rated, and not the best value for money. But we had a great stay there. The hotel should hava a outside pool, or some of the beach for hotel guests. Now Its just a inside pool in the basement and no windows. 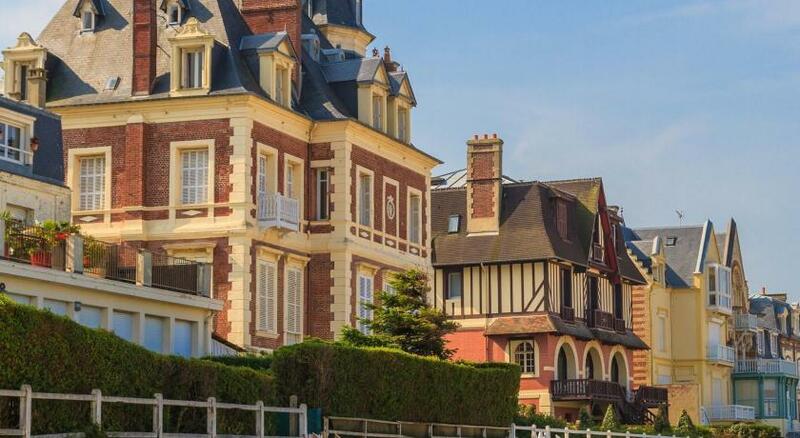 One of our top picks in Trouville-sur-Mer.Located in Trouville, Cures Marines Trouville is 700 feet from the beach and 200 feet from Trouville Casino. 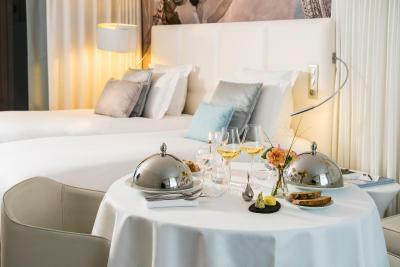 This hotel offers free WiFi, a 24-hour front desk and a restaurant. A sauna and a fitness room are also available. 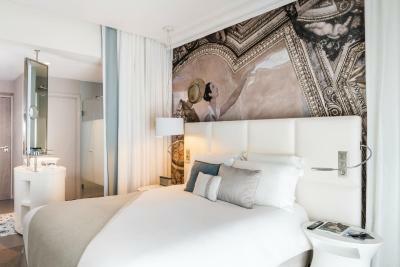 Serviced by a elevator, all rooms are air-conditioned and feature a flat-screen TV, and a wardrobe. 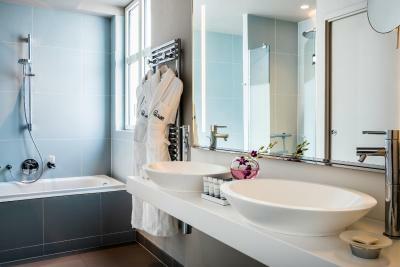 They also include a bathroom with free toiletries, a hairdryer and a bath or shower. 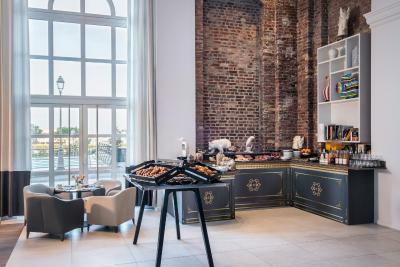 Breakfast is served every morning at Cures Marines Trouville. Offering sea views, the restaurant serves gourmet dishes made from regional products. A wellness center with a hammam is at guests’ disposal with an extra cost. Massage treatments can also be arranged at an extra cost. 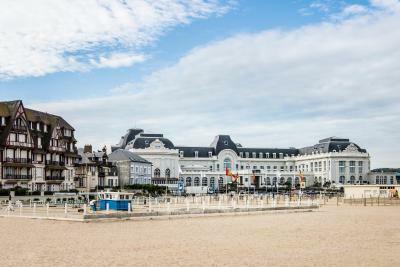 This is our guests' favorite part of Trouville-sur-Mer, according to independent reviews. 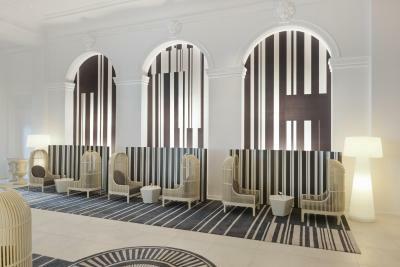 When would you like to stay at Cures Marines Trouville Hôtel Thalasso & Spa - MGallery by Sofitel? Offering sea or port views, this larger room features free WiFi and a flat-screen TV. Please note that cot beds cannot be accommodated in this room. Offering sea or port views, this room features free WiFi and a flat-screen TV. This larger room features free WiFi and a flat-screen TV. 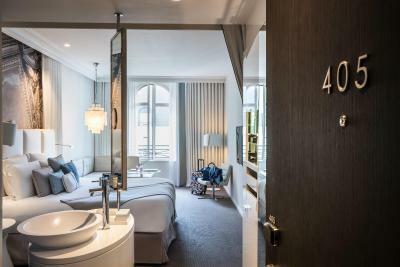 This double room features air conditioning and a view of the inner courtyard. This triple room has a electric kettle, soundproofing and sofa. 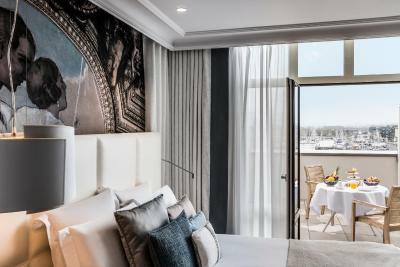 House Rules Cures Marines Trouville Hôtel Thalasso & Spa - MGallery by Sofitel takes special requests – add in the next step! 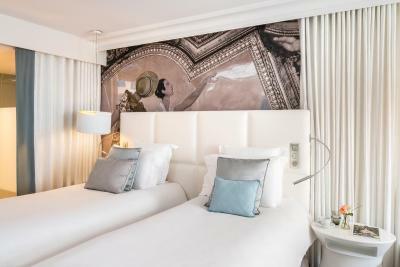 Cures Marines Trouville Hôtel Thalasso &amp; Spa - MGallery by Sofitel accepts these cards and reserves the right to temporarily hold an amount prior to arrival. 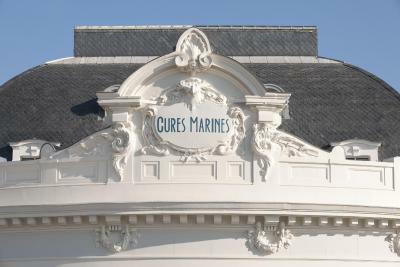 Cures Marines Trouville Hôtel Thalasso & Spa - MGallery by Sofitel accepts these cards and reserves the right to temporarily hold an amount prior to arrival. Please note that for use of the hammam, guests must reserve in advance. The spa is really not a five-star operation. The swimming pools are not designed for actual swimming, the layouts are strange and the space is not comfortable in general. That being said, the hammam and sauna are nice. Price level in relation to the quality. Hotel is just not very special and not special enough to justify the price level. Location was fine, close to the beach. Staff was friendly. 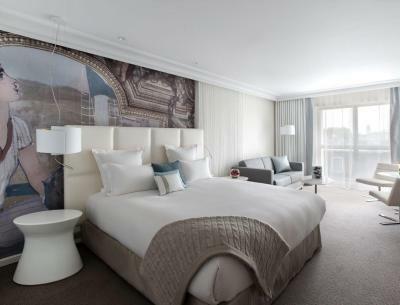 The Superior Room which is located in an extra level, which is only reachable by an extra stairway. Also the room should have according discription 30 m², it´s not more than 25 m². Which is really small for the room and this price ! This hotel is pricey, and we felt it didn't meet expectations at this price level. Take breakfast at a fixed price of 70 euros a couple - a croissant and a cup of coffee just does not cut it at this price (fortunately there is a cafe across the road). And the brasserie room is the most atmosphereless airport waiting room you could ever imagine. 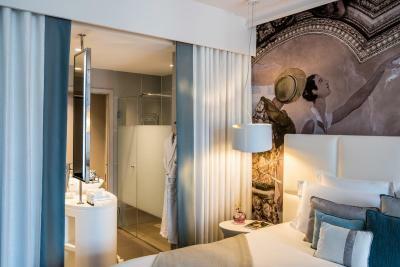 In our (small) room the bathroom was disappointing - the washbasin was tiny, with no room for cosmetics etc., . Parking is extortionate, and not included in the hefty room price. Disappointing. 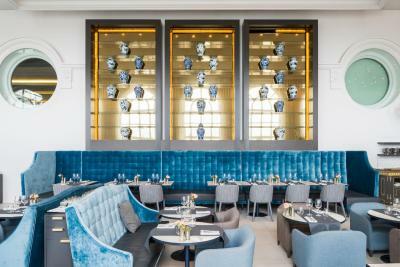 Spacious modern hotel, by the beach, Brasserie serves lovely food and is busy so it has a nice atmosphere. Good restaurants nearby. The Hotel Really does live up to its first class billing. Just spent our 35th anniversary there staff left a bottle of bubbly in the room/ very thoughtful. Highly recommend! Restaurant staff was a bit cranky. Medium cooking became well done, etc. No plates at the breakfast. Entering the restaurant they left us standing there for 5 minutes before helping us with a table. Hardly any good English speaking staff in te F&B area, which I find astonishing for a 5 star hotel. Room was very small, not even space for a suitcase te be opened. 25 euro per day parking fee. It feels like being in an old people's home. 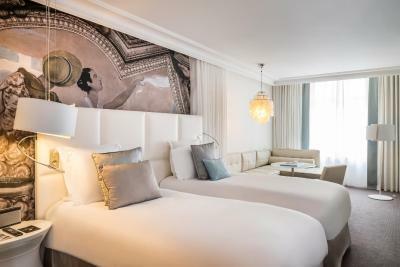 The king suite room design is extremely poor, and not privacy focused. Materials are cheap, and old fashioned. You literally cannot go to the bathroom when someone else is in the room. Room service breakfast is average. Staff on the phone is not properly trained, without being rude though, just not trained to answer customers.